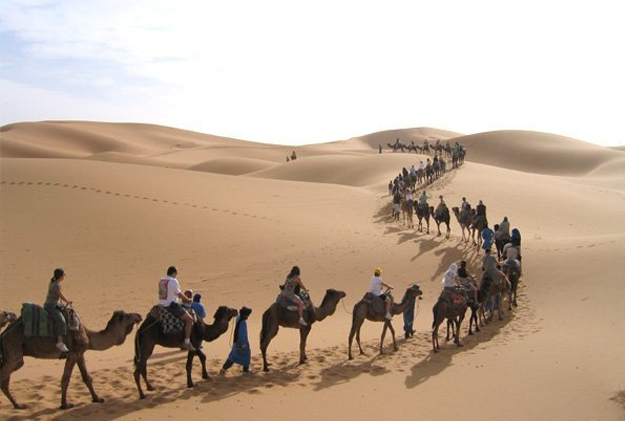 Dades Departure at 8 am from your hotel or riad in Marrakech to cross the High Atlas. 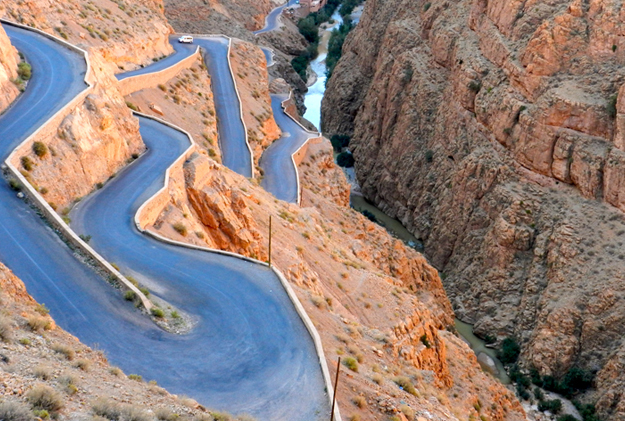 Cross these mountains, valleys and visit Berber villages. These villages are carved into the mountainsides, sometimes barely distinguishable from the same mountains. They are spectacular. After crossing the mountains continue descending to reach Ouarzazate, where we stop for lunch. The route continues to the oasis of Skoura, where numerous ancient Kasbahs out among the palms. From here, the route leads through Kelâa M’gouna, the Valley of the Roses. We will stop to see the handmade cosmetics oil from roses that are very abundant in the valley. We stop in the Dades Gorge in a guest house very ethnic. After breakfast, take a walk by the river before continuing to Todgha. After lunch we will go to bivouac in the dunes of Erg Chebbi. Visit the Ziz Valley and the towns of Erfoud and Rissani. In the afternoon you can take a camel ride for two hours through the desert. The sunset from the top of the dunes is spectacular and the altitude is 250 meters. After dinner and spend the night in a traditional nomad tent at the foot of the dunes. 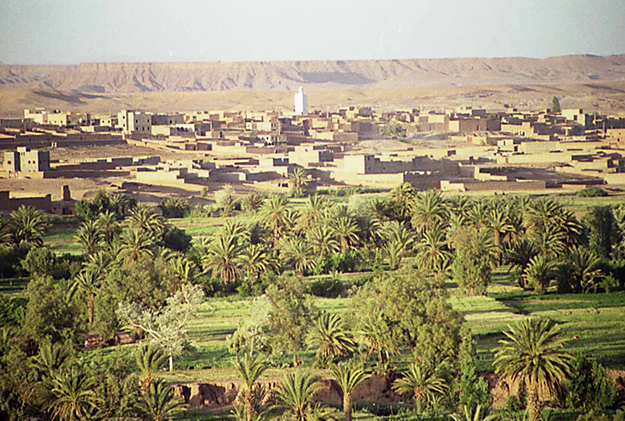 The route continues to the Draa Valley through Tazzarine people (who appears in the film Babel), and then to Nkob for lunch. In the afternoon we drive through the valley of the Draa to Aqdaz, through oases and Kasbahs along the river. 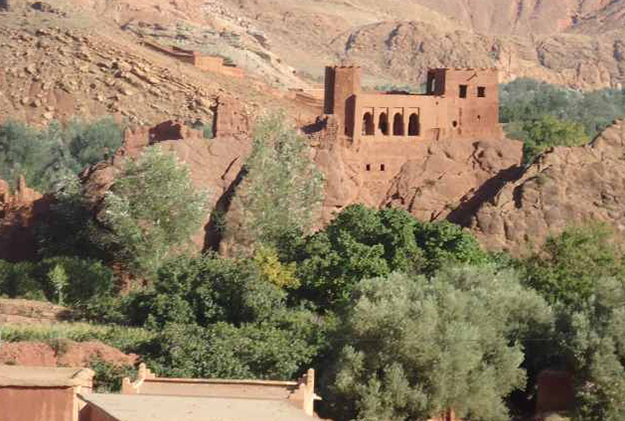 The oldest Kasbah, Kasbah Tamnougalt in the Draa valley is close Agdez, and have time to visit. Some parts are in ruins but the rest are occupied in its entirety. In the latter part of the day pass by the Tizi-n-Tinififfte to Ouarzazate. Here we spend the night. After breakfast, visit the kasbah Taourirt, in the city that belonged to the Glaoui family. From here, drive north we leave the main road and a secondary road to Ait Ben Haddou, which also belonged to the Lords of the Atlas, the Glaoui family. It is the most famous Kasbah in Morocco and a place that is part of the World Heritage. It is also well known for being the setting for many Hollywood blockbusters. The road through the valley Ounila continue with its beautiful villages, breathtaking mountains and overlooking Telouet, where we stop to visit the Kasbah and have lunch. Alternatively, lunch may be in the mountains. 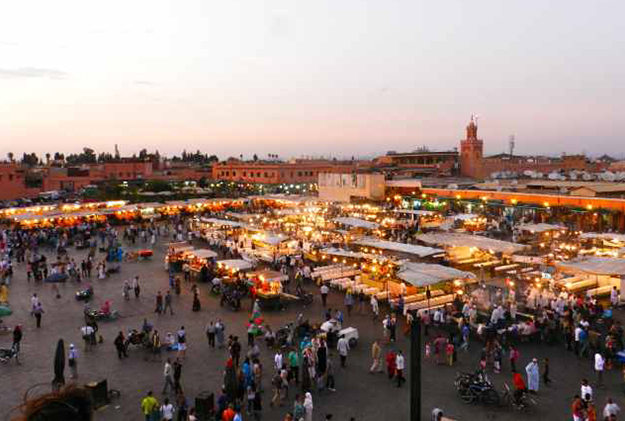 Arrive in Marrakech in the afternoon.